'Collect Spring Lanterns, and use them to collect origami animals. 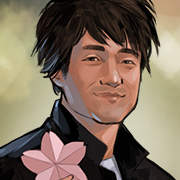 1 How can I participate in the Spring Event? 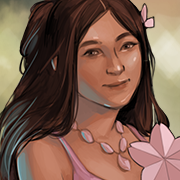 How can I participate in the Spring Event? 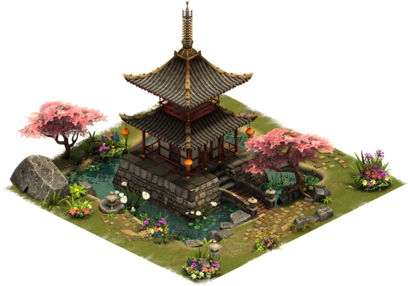 The Cherry Blossom Festival makes it's return in the Spring Event. 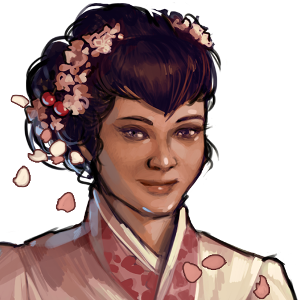 Your citizens all flock to the parks, to witness the joy of Cherry Blossoms blooming! 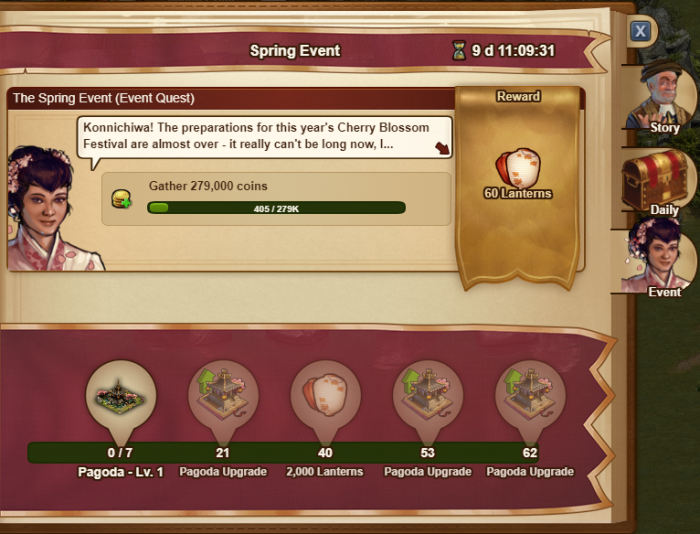 Cherry Trees in the 2019 Spring Event work the same as Incidents within your city. What this means is that there is a chance every day of between 10-15 Incidents spawning in your city, and some of these may spawn as Cherry Trees. However, this isn't guaranteed, and Cherry Trees shouldn't be relied on, but simply a little extra bonus for when you do find them! 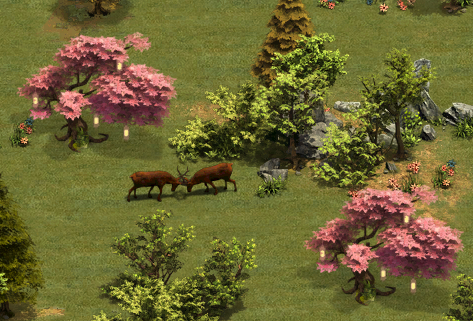 Additionally, in previous years Cherry Trees would also spawn when completing quests. This is no longer the case. Cross ponds to move up in the League Table. You are competing against other players, so if you stop playing, you could find yourself falling back down to lower leagues! At the end of the event, the top players will be rewarded with extra special prizes! You move up the league for every full pond crossed. This means that an element of strategy must be employed! Do you go for the origami animals with the individual rewards you seek, or for the one which progresses you closest to the end of the pond? Its up to you! But be aware, other players may want to also get into the higher ranks, but only a certain amount of players can stay there. Be sure to help your Frog progress in order to not fall in ranks. 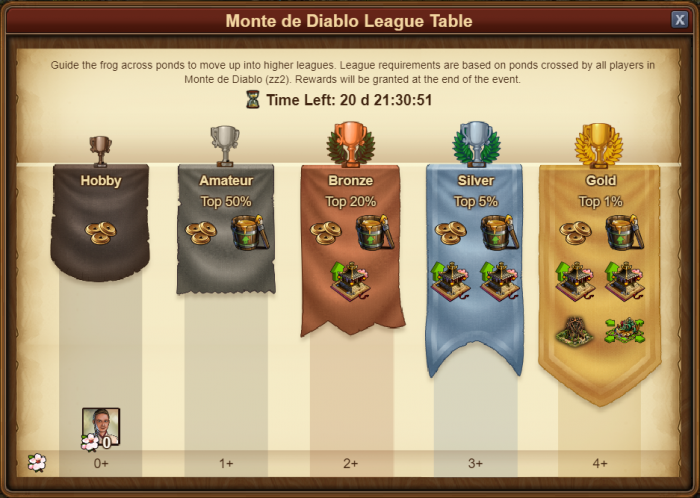 Every rank in the League offers you different rewards in the Spring Event. The rewards will only be given, at the end of the event. There are 62 quests in total to aid your progress. 41 rush quests, and then a further 22 Daily quests! Each completed quest contributes to the counter at the bottom of the quest window, and you will unlock new prizes at 7, 21, 40, 53 & 62 quests! 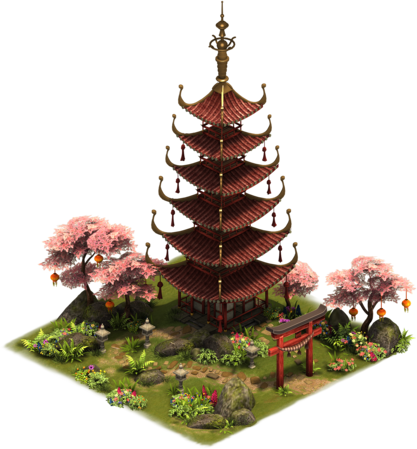 With the Spring Event 2019 the Pagoda makes it's return to form a magnificent centerpiece for your city. 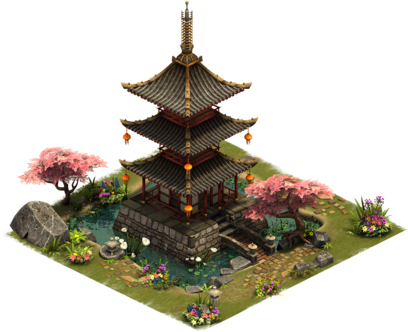 In this year's event, your citizens have been hard at work planning on some some beautiful changes to this once modest residential. 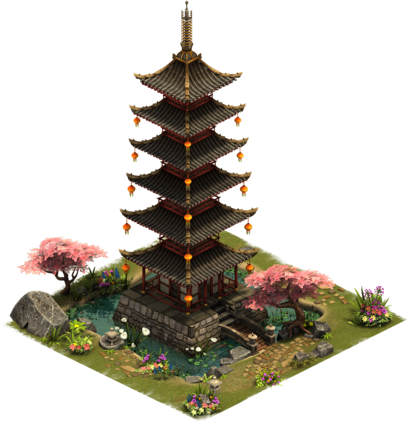 The Pagoda can now be upgraded to level 7 and has a size of 4x4. The higher it is upgraded, the more and better bonuses it delivers. Once you reach level 7, you will have the option on how you want your final piece to look. You can choose between Water, Earth and Fire. Each unique look also offers unique rewards. 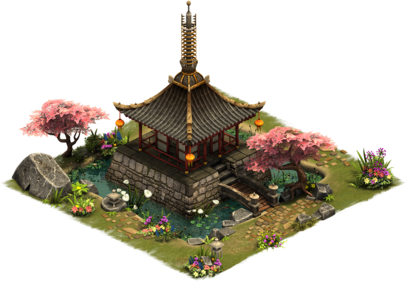 To upgrade your Pagoda you will need the Pagoda Upgrade Kit. 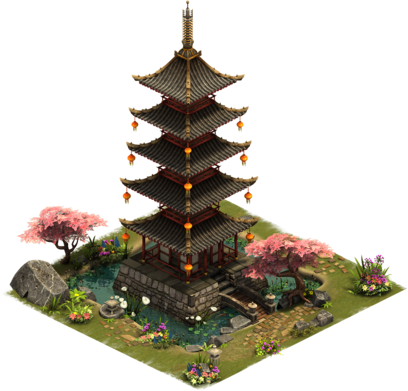 Some of you will already have a One Story Pagoda (Level 1) from previous years, but don't worry if you don't! 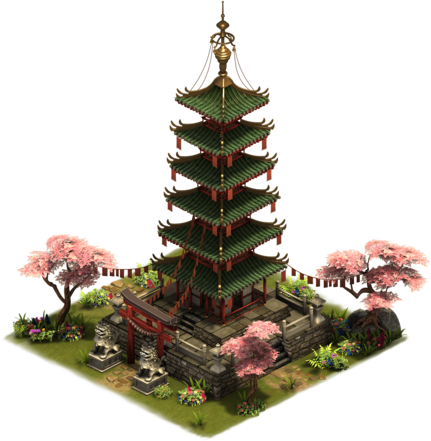 You can get the Pagoda - Lv. 1 and some upgrade kits from the questline and as a reward for crossing the pond. 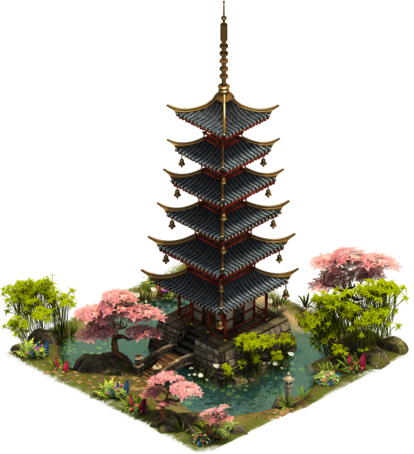 Once your Pagoda is at level 6, you will be given three choices on how you want to proceed. When using your next upgade kit, you're presented with the option of transorming your Pagoda in to an Earth, Water, or Fire Pagoda. 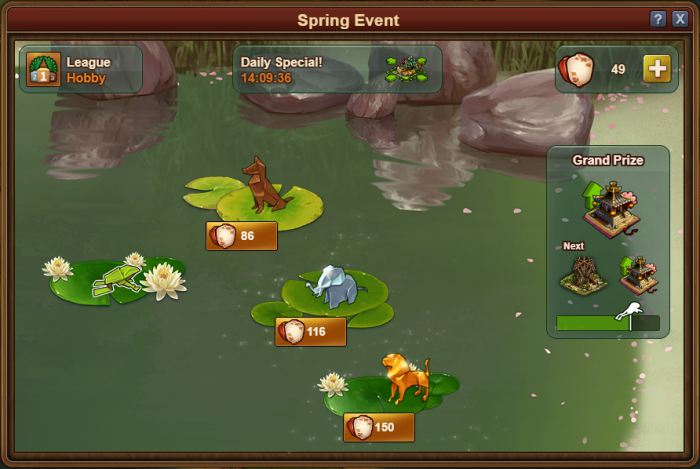 There are two avatars which can be obtained during the Spring Event questline. This page was last modified on 26 March 2019, at 19:44.